When the sun sets in Kauai people start collecting their cameras and gathering on lanais, their front yards, restaurants or favorite beaches. The moment is special and sometimes almost reverent. It's a great way to end a perfect day in paradise. Sunsets are just more beautiful in Hawaii and perhaps best of all when they happen over Bali Hai. There are many great locations in Princeville to watch the sun go down. 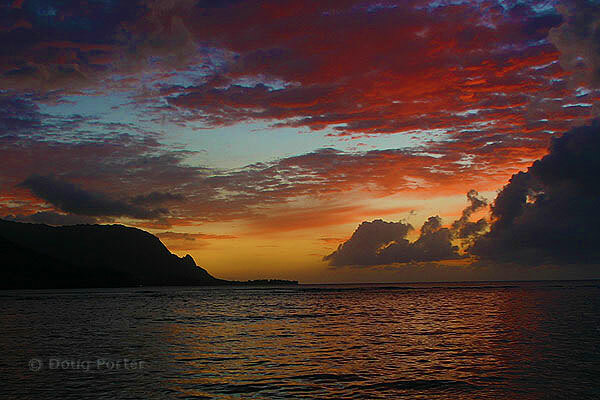 This picture was taken on Pu'u Poa Beach just below Hanalei Bay Resort. The Bali Hai Restaurant and the Princeville St. Regis Hotel are also ideally situated to watch the show.